Goliath Dog House - Custom Cedar Dog House for 200 lb+ Dogs! 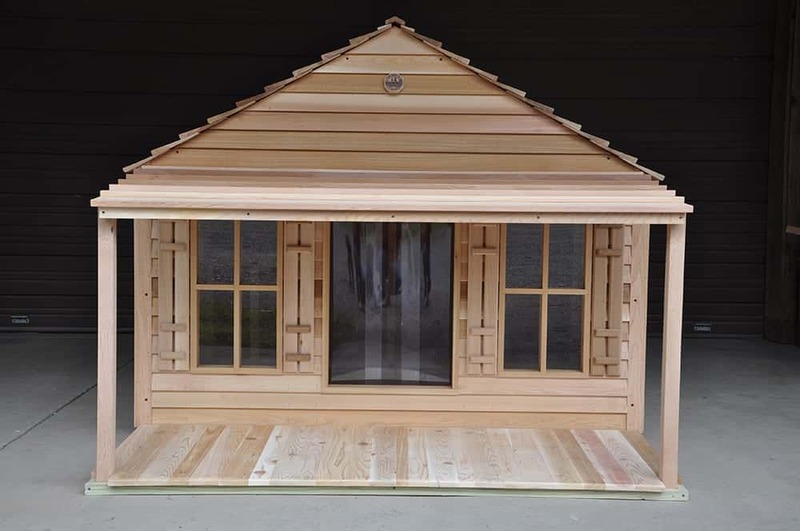 Dog house pictured includes optional Extra Large Windows, Porch & Deck. Our Dogaire™ air conditioning system can cool this huge house in minutes no matter how hot it is outside! If you live in a climate that experiences the extreme coldest winters, our electric dog house heater will maintain a warm and cozy temperature inside as well. To achieve superior energy efficiency with cooling or heating with these systems, we highly recommend the upgrade Seal Safe ™ door along with insulation. This dog house consists of seven pre-drilled easy to assemble panels and comes with a heavy duty vinyl flap door installed. Finally, the Goliath houses have a roof line that causes the rain to fall to the side of the house, not at the door where your dog would track in mud and water!